All pet lovers treat their pets just like children. As a pet parent, you’re looking for ways with which you can improve their lifestyle. With Petcube (bites plus play) boxes, you can cater for your pets even when sitting on the other side of the world. Sounds interesting? We know it does. With Petcubes you can play, treat, and look after your pets via smartphone apps. 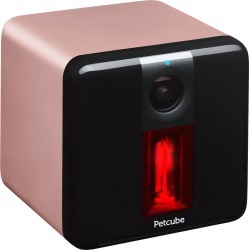 The Petcube Bites allows you to serve pet food as a reward for their good behavior, whereas with Petcube Play you can play with your pet through a laser light. Petcube boxes have installed cameras with which you can see your pets, all the time. Apart from simple viewing, you can capture photos and record videos, in high definition, and share them with your friends. Now, whether you’re in office, market, or even out of the city, you can monitor your pet from your smartphone through Petcube apps.